At the 13th annual HM Conference in London hm-13-16, I am participating in a session where I shall present the key ideas in my new book, The Long Depression. You can get a gist of those themes from a previous post. Also participating are Jim Kincaid, Al Campbell and Erdogan Bakir who will offer some short comments on my book and its conclusions. Al Campbell will deliver his comments at the session, but before the session, Jim has posted on his own (very interesting) blog, an opening critique of my empirical work along with an alternative approach to the current crisis. You can read Jim’s full critique, which is just an opening shot, on his blog. But the essence of my reply follows below. I apologise for the length of this post in advance, but both Jim and I thought it would be useful to post our opening thoughts before the HM session so others could consider the arguments. Jim is very kind in praising much of my efforts on my blog and in the book to develop Marxist economic theory with empirical evidence. But I’ll concentrate on dealing with Jim’s critique of my work on the post-war profitability of capital in the US, its relation to Marx’s law of the tendency of the rate of profit to fall and the causes of crises under capitalism, particularly the cause of the Great Recession of 2008-9. Jim first says that “I do not think that Roberts’ data about US profit rates actually support some of the conclusions he draws about trends over the past 20 years”. 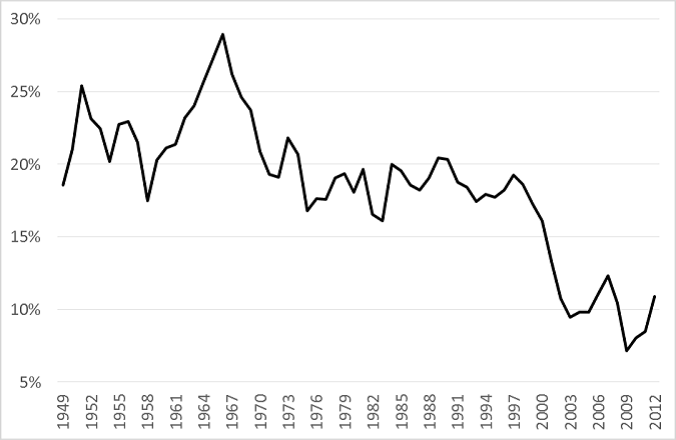 He hints that, when I say there has been a secular decline in the US rate of profit in the post-war period, I might be misleading readers into thinking that this has been “a continuous fall”, when instead there have been “two periods of recovery” with the rise after 2000 being “the most significant”. Well, I have to plead not guilty here. Nowhere, I have stated or implied in any of my papers or work that there was a ‘continuous fall’ in the US ROP. On the contrary, I have made much of the recovery in profitability since the early 1980s as revealing the impact of the counteracting factors that Marx outlined in his law of profitability. So this is a straw man on Jim’s part to knock down. There has been a secular fall and, as Jim says, “this is clearly correct”. But as Jim says, “Michael Roberts’ own empirical work makes evident, there has not been, over the past 20 years, a simple linear fall in the US rate of profit. Rather what we see are cyclical patterns of oscillation. 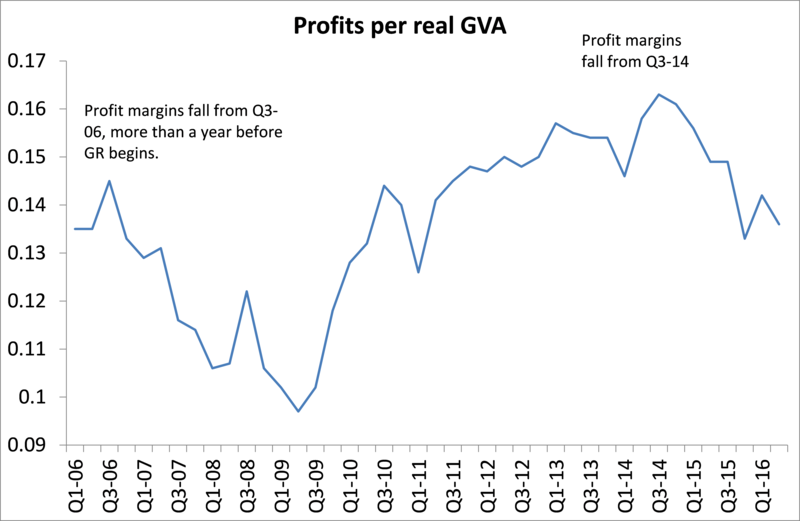 Falling rate of profit tendencies are battling it out against counter-tendencies”. Another red herring, in my view, is Jim’s claim that I reckon changes in the organic composition of capital cause changes in the short-term business cycle. As Jim says, “Marx himself saw the organic composition of capital as changing over longer periods of time, not as the cause of short-run movements in the business cycle.” I agree. And I don’t think that I have argued that it explains ‘short-term’ movements. But it is essential to explaining why the rate of profit will fall over time, namely because of a rise in the organic composition of capital, unless counteracting factors (like a faster rise in the rate of surplus value) dominate. Indeed, this explains the movement in the US rate of profit in the post-war period. 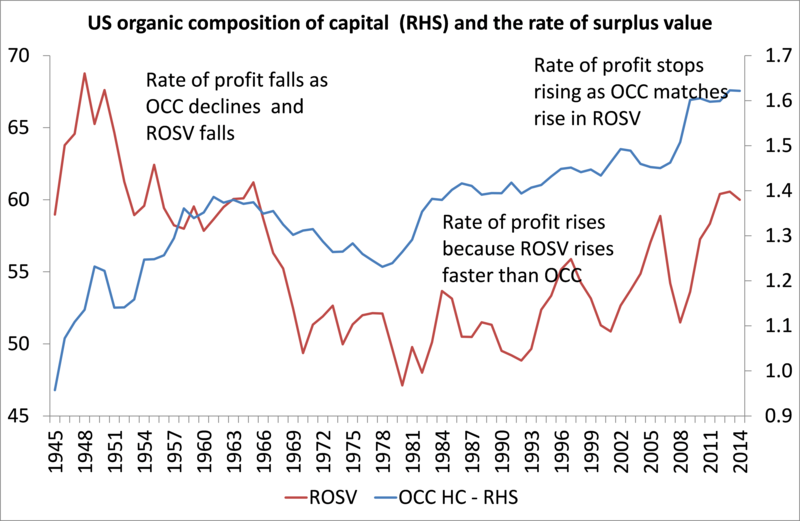 The organic composition of capital rises secularly but with a fall from the mid-1960s to the end of the 1970s. It rises in the neo-liberal period from the early 1980s, but the rate of exploitation rises faster. In the 2000s, the rise in the organic composition accelerates to match the rise in the rate of surplus value and so the rate of profit stops rising. More specifically, Jim reckons that I cannot draw the conclusions from my own data that: 1) that the US rate of profit peaked in 1997 and has been static or falling since then: 2) the US rate of profit started to fall again from 2010 or 2012 (depending on the measure used): and 3) the fall in the rate of profit has now given way to a fall in the mass of profits. Instead Jim reckons that my data show no such fall after 1997 and indeed the rate was higher in 2007 and “profitability fell in 2008 and after as a result of the financial crisis rather than as its cause”. Well, two things here. Jim uses the Kliman measure of the rate of profit in his Figure 2. That does show a rise in the rate of profit from a low in 2001 to a high in 2006 that is higher than in 1997. But there is a clear fall from 2006, a good two years before the Great Recession began in 2008. So, even on these data, the rate of profit did not fall “after” the financial crisis but before. Annual figures for the rate of profit are not very helpful on the timing here. In my original work that Jim is quoting from, I also used the quarterly figures provided by the US Federal Reserve Bank. The Fed data can give us the non-financial corporate sector rate of profit by the quarter. 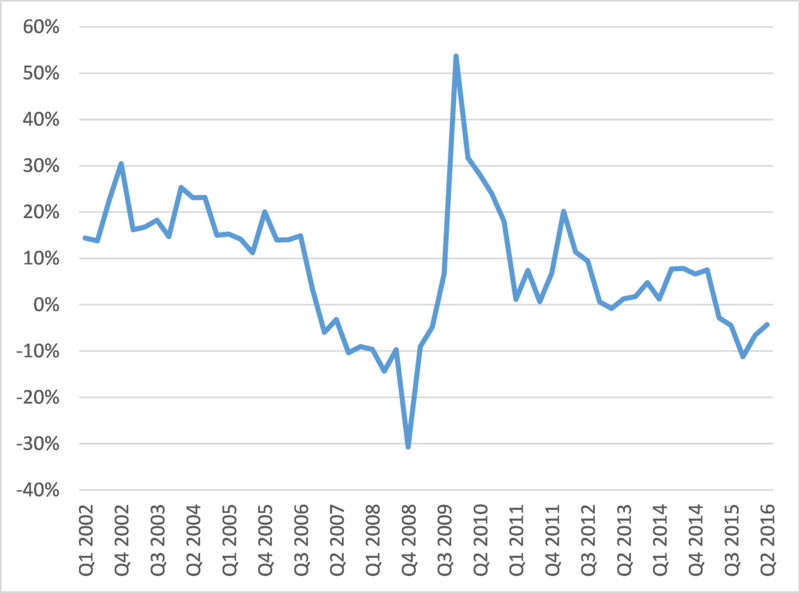 According to that data, the US NFC rate of profit started falling in Q3-2006. Indeed, by the time of the credit crunch in mid-2007 (before the start of the Great Recession, the NFC ROP had fallen 20%). Interestingly, the Fed data also show that the NFC rate of profit at that time was well below the peak reached in 1997 (10% lower). It is currently more than 10% below 2006. Jim says my data show a fall in the US ROP only in 2015, so my claim of a fall earlier is incorrect. Well, as Jim says, on the annual measures, the peak in ROP since the end of the Great Recession was in 2014, not 2012, although the difference here is tiny. And in 2015, the ROP fell. But if we look at the Fed’s quarterly data, we find that the peak was as early as Q3 2010 and is now some 20% below that peak. Now Jim says that I argue that a fall in the rate of profit is “normally followed by a rise in the mass of profit which is only a temporary phase”. He then measures the mass of profit against gross domestic income (his Figure 3) which shows that the mass of profit has risen ‘permanently’ up to 2015. Well, I don’t think Jim has properly presented what I do say. What I argue, a la Marx, is that a fall in the rate of profit will eventually affect the mass of profit and lead to its fall – and this is usually a key indicator of a subsequent fall in business investment and a slump in capitalist production. Indeed, this is the cyclical process of a recession. 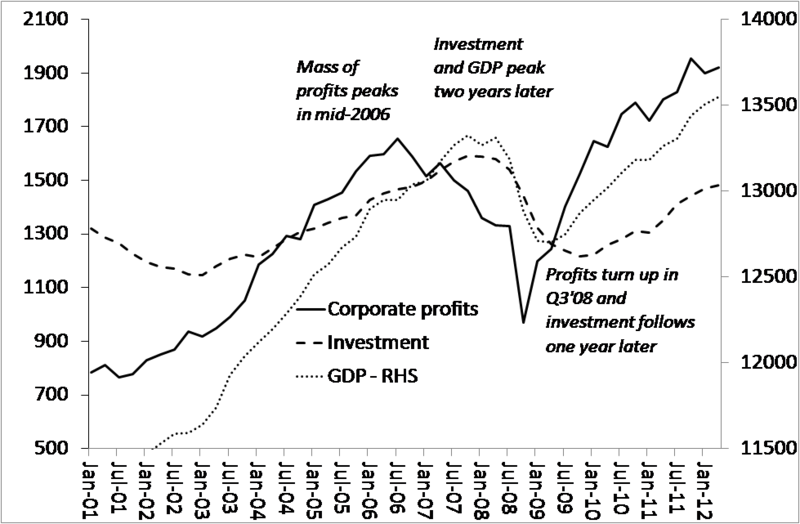 We can see the process leading up to the Great Recession in this graph of US business profits, investment and GDP. The point that I am making is that the mass of profit will only start falling after the rate of profit has begun to decline. If the US rate of profit started falling, say in 2012, or at least stopped rising, then we can expect the mass of profit to do so later. Indeed, as Jim shows with his profit margin figure (profits as share of GDI), that happened in 2015. This suggests that a fall in US business investment will follow and eventually bring a new slump in GDP. 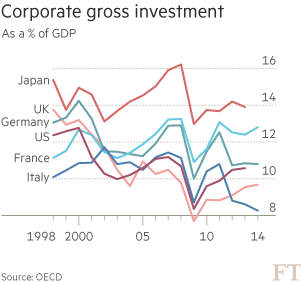 Indeed, US business investment has been falling for five quarters. We can get quarterly figures for profit margins in the non-financial corporate sector (profits as a share of real gross value added) from the BEA NIPA. This is what they show in the figure below. Again, the mass of profit in non-financial corporations began to fall well before the credit crunch of 2007 and the Great Recession of 2008-9. Then it recovered hugely before peaking in fall 2014 (earlier than 2015 on the annual data provided by Jim). Profit margins are now back to 2006 levels. Now, as Jim makes clear, the purpose of his critique of my data and conclusions on the US rate of profit is to “support to the broader argument I have been developing that in this period the system has been contending, not with falling rates of realised profit, but rather with an excess of profit relative to the levels of investment which have been lagging”. As Jim says, he has been developing this view of the cause of the Great Recession for a while. I think he presented it back in 2014 at HM. In an abstract then, Jim said that “(1) empirically, the thesis of falling rates of profit in the major economies is based on an uncritical use of not always reliable government data; (2) Harvey and other sceptics are correct to stress that central to the present crisis is the inability of the global system to absorb large quantities of surplus money capital derived from high rates of surplus-value extraction (profits included)”. Jim argues that it was not, as I argue, a falling rate of profit, or too little profit that caused the Great Recession and subsequent weak recovery, but too much. Capitalist firms have built up huge cash reserves from profits that they are not investing productively. So the problem is one of how to ‘absorb’ these surpluses, not how to get enough profit. This also shows, according to Jim, that the causal sequence for crises, is not, as I argue (as above), falling profits leading to falling investment to falling income and employment because we have rising profits and falling investment. Well, I have to say, despite Jim’s denials, his thesis sounds pretty close to that of Paul Sweezy and Paul Baran of the Monthly Review ‘school’ that monopoly capitalism has sunk into stagnation because it cannot dispense with ever-increasing surpluses of profit. But let us consider this argument. The idea of a global savings glut has become popular among mainstream economics, both monetarist like Ben Bernanke, the former US Fed chief and Keynesian like Martin Wolf, the FT journalist. Both Wolf and Jim (on his blog) have presented evidence of this corporate savings gap. This gap, technically called ‘net lending’ by corporations, Wolf describes as a global ‘savings glut’. The notion of a “savings glut” was first mooted by former Federal Reserve chief, Ben Bernanke, back in 2005. He argued that economies like China, Japan and the oil producers had built up big surpluses on their trade accounts and these ‘excess savings’ flooded into the US to buy US government bonds, so keeping interest rates low. But is the gap between corporate savings and investment caused by a ‘glut of savings’? Well, look at the graph provided by Wolf, taken from the OECD. 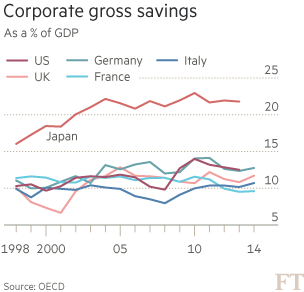 With the exception of Japan, since 1998, corporate savings to GDP have been broadly flat. And for Japan, the ratio has been flat since 2004. So the gap between savings and investment cannot have been caused by rising savings. The second graph shows what has happened. We can see that there has been a fall in the investment to GDP ratio in the major economies, with the exception of Japan, where it has been broadly flat. So the conclusion is clear: there has NOT been a global corporate savings (or profits) ‘glut’ but a dearth of investment. There is not too much profit, but too little investment. But what about the issue of cash mountains in major non-financial companies? It is true that cash reserves in US companies have reached record levels, at just under $2trn – see graph below. (All figures come from the US Federal Reserve’s flow of funds data.) The rise in cash looks dramatic. But also note that this cash story did not really start until the mid-1990s. In the glorious days of the 1950s and 1960s when profitability was much higher, there was no cash build-up. But the graph is misleading. It is just measuring liquid assets (cash and those assets that can be quickly converted into cash). Companies were also expanding all their financial assets (stocks, bonds, insurance etc). When we compare the ratio of liquid assets to total financial assets, we see a different story. 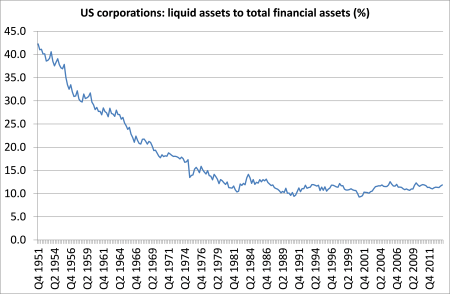 US companies reduced their liquidity ratios in the Golden Age of the 1950s and 1960 to invest more. That stopped in the neoliberal period but there was still no big rise in cash reserves compared to other financial holdings. And that includes the apparent recent burst in cash. 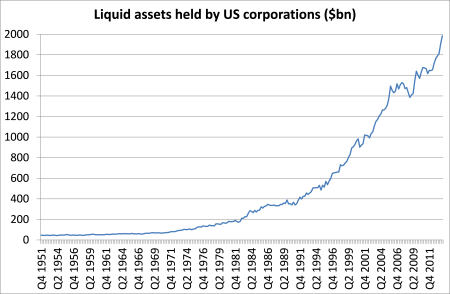 The ratio of liquid assets to total financial assets is about the same as it was in the early 1980s. That tells us that corporate profits may have been diverted from real investment into financial assets, but not particularly into cash. 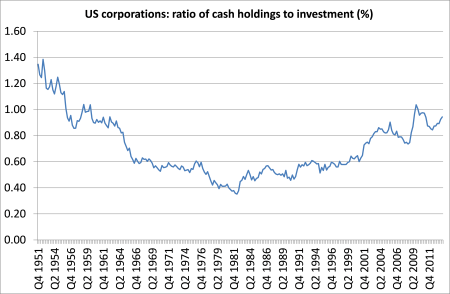 Comparing corporate cash holdings to investment in the real economy, we find that there has been a rise in the ratio of cash to investment. But that ratio is still below where it was at the beginning of the 1950s. And remember within these aggregate averages lies the reality that just a few mega companies hold most of the cash while thousands of small and medium enterprises (SMEs) hold little cash and much more debt. Indeed, a minority are really ‘zombie’ firms just raising enough profit to service their debt. Why does that cash to investment ratio rise after the 1980s? Well, it is not because of a fast rise in cash holdings but because the growth of investment in the real economy slowed in the neoliberal period. The average growth in cash reserves from the 1980s to now has been 7.8% a year, which is actually slower than the growth rate of all financial assets at 8.6% a year. But business investment has increased at only 5.3% a year in the same period, so the ratio of cash to investment has risen. Interestingly, if we compare the growth rates since the start of the Great Recession in 2008, we find that corporate cash has risen at a much slower pace (because there ain’t so much cash around!) at 3.9% yoy. That’s slightly faster than the rise in total financial assets at 3.3% yoy. But investment has risen at just 1.5% a year. So consequently, the ratio of investment to cash has slumped from an average of two-thirds since the 1980s to just 40% now. So companies are not really ‘awash with cash’ any more than they were 30 years ago. 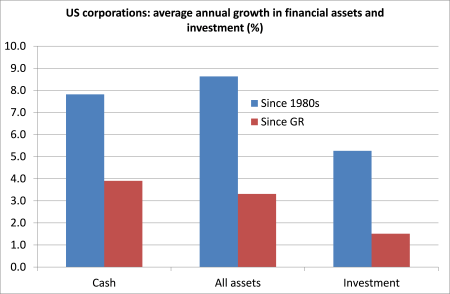 What has happened is that US corporations have used more and more of their profits to invest in financial assets rather than in productive investment. Their cash ratios are pretty much unchanged, suggesting that there is not a ‘wall of money’ out there waiting to be invested in the real economy. This brings me back to the point I left earlier when I showed that the profitability of non-financial corporations did fall after 1997 and remains well below. What that tells me is that after 2000 the corporate profitability measure (Kliman) or the ‘whole economy’ measure (Roberts) express the rise in the profitability of the finance and other unproductive sectors of the US economy, while the productive sector ROP continued to fall. In other words, much of the rise in profitability and profits after 2000 was fictitious. Can I justify that conclusion? Jones[i] adjusted the official US figures for profit for fictitious profits, namely those made by banks from lending to government (bond purchases) and from utilising the savings of workers (mortgages etc) to come up with a measure of profit that best represents surplus value created in production and realised by the productive corporate sector. When he puts this against net fixed assets, the result looks like this. So the post-2000 divergence between corporate profits and capex disappears and can be explained by a rise in investment in financial assets or what Marx called ‘fictitious capital’. Yes, large firms in the capitalist sector of the major economies have been hoarding more cash rather than investing over the last 20 years or so. But they are not investing so much because profitability is perceived as being too low to justify investment in riskier hi-tech and R&D projects, and because there are better returns to be had in buying shares, taking dividends or even just holding cash. Also many companies are still burdened by high debt even if the cost of servicing it remains low. The high leveraging of debt by corporations before the crisis started now acts as a disincentive to invest. Corporations have used their cash to pay down debt, buy back their shares and boost share prices, or increase dividends and continue to pay large bonuses (in the financial sector) rather than invest in productive equipment, structures or innovations. I conclude that the cash reserves of major companies is not an indication that the cause of crises is due to inability to absorb ‘surplus profit’ but due to an unwillingness to invest when profitability remains low and corporate debt is relatively high. That is the cause of this Long Depression. And here is the rub. Just at this time when Jim raises the issue of huge cash reserves and suggests that the cause of crises is due the difficulty of ‘absorbing’ profits, US corporate earnings are falling and profit growth has ground to a halt. Cash reserves are set to fall from here too. This brings me to Jim’s final point. Jim questions my “constant theme – that the crucial underlying cause of the crises of the post-2000 period is that the rate of profit peaked in 1997 and has not recovered since.” He says it is “logically questionable” assumption, that if crises are recurrent (even though different in form) there must be a single and common cause. Jim says, the empirical evidence for Marx’s law has “complex results which have to be explained dialectically and not by looking for a single unilinear cause”. Well, I don’t think it is ‘logically questionable’ to argue that recurrent and regular crises may have a common underlying cause. On the contrary, the regular and re-occurring crises make it logically questionable to look for different causes for each crisis, as many have done, from David Harvey, Panitch and Gindin, Dumenil and Levy etc. Jim says that the contradictions within capitalism can “change the current configuration of the system. The tendency of profit rates to fall is not in itself a contradiction.” Well, I thought it was “the most important law in political economy” (Marx) precisely because it showed the main contradiction in the capitalist mode of production ie. between developing the productive forces (raising the productivity of labour) and the profitability of capital; between the drive to raise profits for individual capitals and the unintended consequence of falling profitability in the whole system. The real question is whether the claim that the Marx’s law of profitability as the underlying cause of crises under capitalism can be empirically validated. That is what my work and the work of many others attempts to do. And I think we are achieving that. This entry was posted on November 10, 2016 at 8:35 am and is filed under capitalism, economics, marxism, Profitability. You can follow any responses to this entry through the RSS 2.0 feed. You can leave a response, or trackback from your own site. Great post. Funny how the same Sweezy like arguments get regularly recycled. Kincaid thinks the tendency of the profit rate to fall is a cause in the nondialectic sense. Like if it was an alien force of nature that acts upon capital. But the tendency of the profit rate to fall is not a cause in this sense. It is the synthesis of the inner contradictions of capital. If das Kapital was a doctorate thesis, the tendency of the profit rate to fall would be its conclusion. “(1) empirically, the thesis of falling rates of profit in the major economies is based on an uncritical use of not always reliable government data; (2) Harvey and other sceptics are correct to stress that central to the present crisis is the inability of the global system to absorb large quantities of surplus money capital derived from high rates of surplus-value extraction (profits included)”. I don’t see the divergence here. If the “global system” is incapable of absorbing large quantities of surplus money capital, then it’s presupposed the rate of profit is low. Put it in another way, the very concept of “excess” money capital automatically means the profit rate is low, just like the capitalist concept of demand implies a demand capable of paying for the commodity, not a human demand. It seems to me more like an academic ego divergence than a real divergence. 1. Robert, once you said that the first sector to feel a recession is the construction sector. I think in you last graph that the construction sector shows that right now it is in recession (I might be wrong, because I am colorblind). Is this assessment true? 2. Should the way LFRP is used with real date be changed? Unlike Marx’s time, most payments are credits and they do not seem to be able cancel out (so, they are not a multiplier of money) due a generalized expansion of debts. So, shouldn’t, then, LFRP be correct due the quantity of deb(not in essence, but in the way it is used to accommodate data)? I have a question to ask Michael. Does he believe, as I do (more intuitively than empirically), that the Brexit and Trump phenomena reflect a split between the many profitability challenged small and mid-sized “debtor” capitalists and the relatively small number of profitable, cash hoarding (?) globalized, mammoth-sized oligopolistic, financially integrated organizations in both countries? Is this split reflected in the one between small (debtor) capitalist countries and large (creditor) capitalist countries within the capitalist order? Obviously, the question, posed this way, is related to the unfortunate dispute between marxists regarding the tendency of the rate of profit to fall, which for me helps explain both the present crisis and the falling out between capitalists. Michael has won the trpf dispute about a hundred times. I agree with him in believing that the denial of trpf (among some marxists) reflects a tendency of the rate of commitment to revolutionary socialism to fall. But, as an elderly American who has long considered the Monthly Review to be the best (revolutionary) socialist journal in the US, I don’t understand why there should be a dispute. Sweezy and Baran analyzed monopoly capitalism within the belly of the beast during monopoly capitalism’s “countervailing,” three decade “golden” era. If they were somewhat consumed by their pioneering and thorough analysis of rampant US consumer capitalism, it’s understandable. But they never rejected Marx’s dialectical approach to the labor theory of value, nor what it implies. I agree. Why such a resistance to Marx’s law of profitability by Marxist academics? I just experienced it again at the annual Historical Materialism conference in London. And I’m afraid the continuers of the MR tradition after Baran and Sweezy do the same. Do fictitious profits derive from surplus value? If not where do they come from? How legitimate is it to abstract them from profits in general.